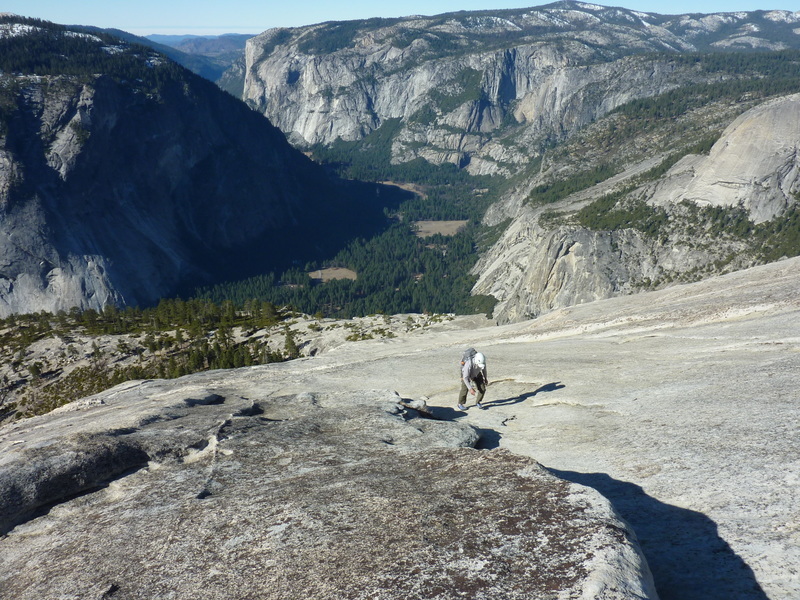 As I was returning from Henry Coe SP a few days earlier I was thinking about a forum post someone had made on SummitPost about the cable route on Half Dome being snow-free. This is fairly unusual for late January, resulting from nearly a month of no precipitation during California's usual rainy season. I had been trying to get my buddy Marty to join me for a climb of Snake Dike for several years now and it seemed it might be a perfect time to do it. I spoke to him that Friday evening, but Saturday morning he let me know he'd decided against it. Time was running out. I had a small window to do this on Sunday and wanted to drive up Saturday afternoon. Who could I get on extremely short notice? I called Karl who sounded interested, but he decided his fear of heights would recommend against it. I then called Matthew and he said "yes" in less than five seconds. I had thought he'd done the route before but had not, and it was very high on his todo list. After a few more minutes of logistics, we made plans for me to pick him up in Union City at 5p that afternoon. We spent the night at one of my less-likely-to-be-disturbed spots inside the park but outside the valley, just off SR120. The next morning the alarm went off at 5a and the day got into gear. It was quite dark at that time of course, and still dark when we started from the hiker parking lot near Curry Village around 5:40a. It was 30F in the valley but warmer higher up and we would be down to just tshirts in the first 30min of hiking. That first hour was spent hiking up the JMT/Mist Trail. Headlamps were turned off shortly above Vernal Fall and by the time we reached our trail exit at Liberty Cap it was plenty light to see by. We followed the use trail around the west side of Liberty Cap to the narrow gap between it and Mt. Broderick. There was only a modest amount of brush to contend with and almost no snow and ice save for some in the upper reaches that was not too difficult to navigate around. When we reached Lost Lake we found more meadow than lake, the sun just beginning to shine on the upper reaches of Half Dome's South Face. We followed the use trail and then ducks past Lost Lake and up the class 3 slabs at the base of the South Face, traversing left (west) up and around to the start of the Snake Dike route on the SW side. It was 8:40a when we reached the start. It was no surprise that we had the route and seemingly the whole mountain to ourselves. What was surprising was how nice weather was. We knew it would be unseasonably warm today, but had no idea it would be in the low 50s this early in the morning. I had brought several jackets, wool gloves, down mittens, balaclava, another hat and even another pair of pants, but all of this would go unused. There was only a light breeze and bright sunshine and one might have been excused for guessing it was May instead of January. We were but ten minutes in getting our gear sorted out and starting up the route. The plan was to belay the first two pitches where the climbing is more difficult, then simulclimb the remaining six pitches or so. Our rack was fairly light, consisting of just two cams, half a dozen carabiners and about the same number of slings. I placed a single cam on the first pitch with the only other placement somewhere above on the simulclimb section. The rest of the route I made use of the bolts which appear to be sprinkled about the face in a nice proportion. The second pitch makes an annoying traverse to the right, up and then back left to reach the main dike. The three bolts I clipped into on P2 create enough friction that it seemed smarter to belay Matthew back over to the main dike before starting to simulclimb. For the simulclimb portion, I had five Tiblok devices which I placed at judicious points to make sure we always had one between us (the Tiblok allows rope travel in one direction - up, blocking it in the downward direction should Matthew fall - this prevents me from being pulled off with him). Matthew's job was to manage the rope from below, taking in rope if if there was too much slack, paying it out if he paused to rest. In practice there was little to manage since I was climbing in front at a faster pace than Matthew, so we always had the full rope length between us. We finished the roped climbing in two hours, spending another 30min to climb the endless slabs to the top. There was only the barest of snow at the summit saddle where I jokingly suggested Matthew should go ahead to test out the snow bridges. The views from the summit are sublime, one of the finest viewspots in all the Sierra, imo. The chasm of Yosemite Valley stretches out to the west with Tenaya Canyon and Clouds Rest to the east. To the south is Mt. Starr King while to the southeast are the higher summits of Yosemite in the Cathedral and Clark ranges. Having the top to ourselves was quite the treat compared to the usual summertime hordes. As were starting down to the cables, a much younger man popped up from the route, having just managed the hand-over-hand climb with little more than a pair of shorts and some muscle. It was quite a contrast to our laden packs. His two friends had decided not to join him for the final stretch, choosing to lay out in the sun at the base and wait for his return. Matthew and I had planned on using prussiks for the descent and that is what he set about doing when he reached the top of the cables. I simply did what the other guy had done in reverse, descending the 400ft or so in about 5min. I chatted briefly with the two friends at the bottom, then climbed a short distance up to Half Dome's shoulder where I could better view Matthew's descent. Because he had to change the prussik 4-5 times where the cables were anchored to the ground he was necessarily slower. The other climber had started down while Matthew was still only about 1/3 of the way down and to his credit he was very patient to wait for Matthew to descend before going lower himself. I'm not sure I would have had the patience. In the meantime, another climber had come up from below and was about to start up. He, too, waited for Matthew to make his descent before starting up. Though it seemed like an hour that I waited there on the shoulder, it was only 35min and I really had nothing to complain about. It was warm, scenic, relaxing, and best of all, we had plenty of time. It was but 12:30p when we started down the shoulder. We began to run into additional parties with surprising regularity. The lack of snow had brought more people to the base of Half Dome today than it usually sees in several months this time of year. There was some snow at the base of the shoulder on the north side, but no more than 4-5" deep and heavily packed by the many visitors over the past few weeks. The rest of the return was mostly uneventful. Not surprisingly, we came across more and more folks the further we descended until it looked like a summertime crowd when we were on the Mist Trail below Vernal Fall. To avoid the crowds we took the less-used route around the south side of the Merced River once we had reached the junction just above the bathrooms and viewing bridge below Vernal Fall. We arrived back in the parking lot shortly after 3p, making for an outing of less than 10hrs, far better than we had expected. We bought ice cream and cold drinks at the Curry Village store before heading out. Temperatures in the shady Valley were only 45F and it felt chilly. Who'd have guessed that the High Country would have been far warmer, sunnier and so pleasant in late January? Ah, this brings me back a few years when Ben and I climbed this on a similarly warm winter day - 2 days before Christmas! Missing the Sierras more and more nowadays.